What is mistake proofing? Well, mistake-proofing to me (poka-yoke is the japanese term generally associated with this) is to make it impossible for someone to make a mistake. Let’s talk about what mistake-proofing is NOT. It is NOT dumb-proof, since if we use this term (“dumb-proof”), we are implying people are dumb. One of the tenets of lean is Respect for People, or, as the Shingo Model calls it “Respect Every Individual” and, as such, we do not point fingers at people, but instead look at the process and fix the process so that it is capable of producing a perfect output every time. In baseball, a ball that goes over the fence while in fair territory, is a home run. It was not always like that, but that is the rule now. Who decides when a ball is fair (home run) or not (foul ball)? Answer: The Umpire. But when that ball sails really close to the foul line, how is the umpire able to tell for sure from 80-100 yards away?!! Is he to completely rely on his Superman vision and his innate ability to stand in the perfect spot to judge whether that ball went over the fence in fair or foul territory? 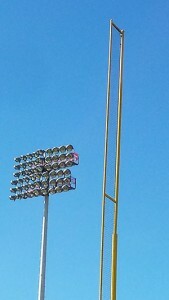 In order to enable umpires to make the right call every time, baseball fields have these really tall poles (as shown in this picture I took during the most recent Spring Training season here in Florida) that help them make an error-free call every time. Instead of leaving it entirely up to the umpires’ eyesight and their ability to choose the perfect spot to make the call, the foul pole is there to take away the possibility of them making a mistake on the call and avoiding some irate fans blaming the umpire (“You need glasses!”, “You can’t do your job!” and a few other dismal remarks) for a bad call. In this way, Baseball, as an institution, is showing Respect for the Individual, by giving the umpires the tools so that they are able to produce a defect-free output (the right call). How many mistakes are made in our hospitals and healthcare institutions? Well, depending on whose analysis you believe, there are estimates that between 210,000 to 400,000 people die in United States’ hospitals every year due to what is called “preventable harm”, which is a nice way of saying mistakes or errors. And these are only the people dying. There are many, many other mistakes occurring that don’t cause death, but cause a lot of the other wastes, and as such, contribute to the close-to-$1-Trillion waste in healthcare! When a nurse, pharmacist, tech, physician or any other provider does their job correctly because they “just know” is like the umpire “just knowing” exactly where to stand to make that call without the help of the foul pole. When we allow broken procedures and broken systems to be used to provide care to our patients, we are NOT showing Respect for every Individual. We are not showing Respect for the providers, who sacrifice so much every day to provide the best care they possibly can, and we are not showing Respect for the patients who trust us to provide mistake-free care. Fostering a culture where staff feels empowered to improve their process every day in pursuit of perfection is a big component of achieving the goal of Zero Harm. This means providing the training and the tools these providers need to improve and mistake-proof their processes. Recognizing that standardization is part of this effort is also an important piece. Most people want to do a good job; a high-quality job; a job that they can be proud of. If we give our staff broken systems and processes which allow them to make mistakes, we are undermining their desire to do a good job. Furthermore, we are crippling their spirit and robbing them of the opportunity to serve the patients as they once hoped to do. When we enable staff to improve their work, to create mistake-proofing devices and methods, we are showing Respect for People. Please, share how your organization fosters a culture of mistake-proofing or the challenges you are facing to accomplish it.